Scotland has one of the worst records on the abuse of older people in the UK, according to a new report. The research by Comic Relief and the UK Department of Health found that most of the victims of elder abuse were men. It said up to 42,000 older people in Scotland were abused in a number of ways, including physically and sexually, in their own or family homes. 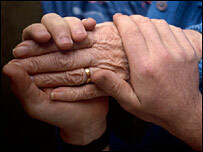 The charity Action on Elder Abuse has called for immediate action by the Scottish Executive to change attitudes. The research, which excluded people with dementia and those living in care homes, indicated that Scotland had the second highest rate of elder abuse in the UK. The figure of 4.2% compared with 6% in Wales, 3.9 % in England and 3% in Northern Ireland. The report suggested that many elderly people were being left in bed, often without access to food or the toilet. It also claimed that two thirds of those carrying out the abuse were family members. Action on Elder Abuse (AEA) chief executive Gary Fitzgerald said most victims were not in touch with adult protection systems. "The scale of elder abuse is quite staggering, particularly when you realise that the research did not include people living in or being cared for in the NHS, care homes, or people with dementia," he said. "This is the hidden abuse of UK society, exposed comprehensively for the first time." Mr Fitzgerald called on First Minister Alex Salmond to make the issue a personal priority, and give the abuse of adults the same level of priority as the abuse of children.